Maguire Jian receiving the Singapore Golden Brand Award for his company – A LUCAS EVENTS. For TV buffs, Maguire Jian should be a familiar face. The multi-talented artiste is a celebrity emcee, comedian, actor and founder of A LUCAS EVENTS. 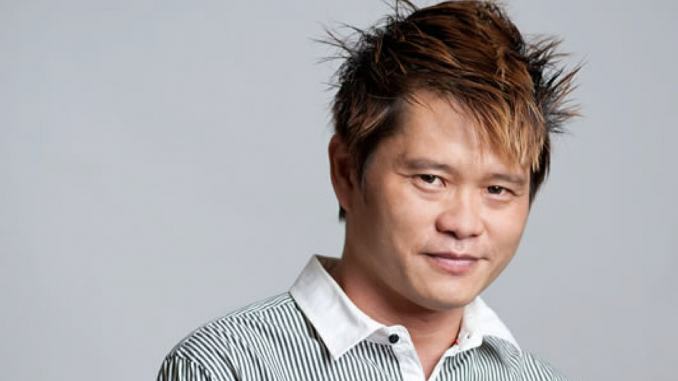 He was also the choreographer for Star Search Grand Final 2003; the producer, Shiong Qiang, had approached him for his assistance. His characteristic spiky hairstyle playfully hints at his entertainer roots. He speaks eloquently and uses Singlish slang. Maguire calls himself a “simple guy”. But on TV, the truth cannot be more opposite. In Season 1 of Channel 5 drama ‘Point of Entry’, viewers hated him so much that they wrote in to Mediacorp to complain. In Season 3, viewers wrote in to express their sadness when he was murdered. “As long as you turn on the TV, when you see a thief, a murderer, that’s me, because I have the bad guy face,” says Maguire. Maguire has roles in many popular local sitcoms as well, such as Mr Kiasu, Phua Chu Kang, Police & Thief, and the movie I Not Stupid. He started out at SBC (Singapore Broadcasting Corporation) as a TV extra on Channel 8. Then, he was with Jack Neo for about two years, and appeared in variety shows like Top Fun and Jacky Jack Show. After leaving Jack Neo, he was invited by Channel 5 to work as a part-time actor in their TV productions. In 2013 & 2014, Maguire acted in Channel 5 drama Mata Mata, Missing Peace and a Toggle movie, and even had a role in the Vasantham sitcom – Tamil.com. Last year, he was cast in Eric Khoo’s new movie ‘In the Room’, where he worked alongside Hong Kong actress Josie Ho, who has won a Hong Kong Film Award for Best Supporting Actress. He has also been a freelance emcee for over 24 years since 1991. His passion for entertaining people is so strong that he founded A LUCAS EVENTS in 2003, so as to get up close and personal with the people around him. Despite the global SARS crisis in 2003, his company survived, driven by his passion – “To make people happy”. Now, A LUCAS EVENTS is a recipient of the Singapore Golden Brand Award. This year, he is also the first Asian to be awarded the “Sir of Strength”, which is given to people who have the ability and capability to help people to be better. Belying his ‘bad guy’ facade, Maguire is a good listener, a joker and a motivator to people around him in real life. Orphaned as a child, Maguire cherishes happiness immensely. “I feel that I have the power to make people laugh, and I feel very happy and blessed that I can achieve this on stage,” he says. If you think you can do it, then you can make it… It is all in the mind, so never poison the mind. Heal the mind, and you will achieve something. His interest to make people laugh was sparked after acting as “Ji Gong” in primary school. Ji Gong is a Buddhist monk who lived in the Southern Song Dynasty; he possessed supernatural powers, which he used to help the poor and stand up to injustice. He is often portrayed as an eccentric character. “I started my first stage performance when the teacher asked me to act as Ji Gong for the Teachers’ Day celebration,” recalls Maguire. From that moment, he discovered his talent in impersonating characters and recalled a distinct feeling of fulfilment when he made his classmates laugh. “That was the happiest moment in my childhood. So I tell myself, maybe I want to be an actor or entertainer so that I can make people laugh. If they are happy, I am happy too,” he says with pride. Maguire is also an emcee, but according to him, emceeing is not as easy as it seems. He has to think on his feet, and when hosting a roadshow, he has to study everything and be like a “part-time salesman”. “When hosting a Dinner & Dance (D&D), I will try to understand the company culture and its people. Singapore is like a national metropolis state with so many foreign talents. I have to understand the culture of different nationalities, and address my jokes to the different nationalities. I use many [jokes on current affairs]. You can’t use jokes that are so old that the audience can anticipate, and then they don’t laugh,” he shares. “I was always the bad guy on TV. Sometimes, my customers were shocked as on stage, I am just a joker,” he quips. What is amazing about Maguire is his ability to impersonate many different characters like Batman, Phua Chu Kang and Auntie Lucy. He can even mimic a police car, Disney characters Donald Duck and Mickey Mouse, Elmo from Sesame Street and Liang Popo. He usually impersonates characters to suit D&D themes. “Perhaps, because I don’t come from a good family background, and [I’ve been orphaned at a young age with] no sibling or relative, my life was never colourful or meaningful. Being the least appreciated, I just want to make people happy around me. That is why I’m actually in this event line,” he divulges. If you ever see Maguire on stage, you can see how warm, charismatic, and funny he is. Looking at this confident and smiling man, it is hard to imagine the tumultuous childhood he had gone through. According to Maguire, he was abused by his foster parents as a young boy. “I was not brought up like any normal child who could have toys to play with and study. I was brought up differently,” he recalls. His grief drove him to the brink of suicide at the tender age of six. “I really wanted to remove myself from this world, because I was very upset. Why were my parents like that?” he reveals. He always scored poorly in school, but it was only in secondary school that he excelled in a subject called ‘Religious Knowledge in Buddhism’. Since then, he has turned to Buddhism for solace; now, it is an important part of his life. He meditates and believes in karmic connections. “Sometimes, when I feel frustrated, I tell myself, ‘I will just meditate and calm down’,” he says. “When you are living in a world with no one with you, the only thing you have to ask for help is God, because God is always watching us,” he continues. When asked if he hated his foster parents, his answer was matter-of-fact – it was karma. “Honestly, right now, I don’t know whether they are my foster parents or real parents. But I will not hate them, because after studying Buddhism, I feel that it is karma. Maybe in my past life, I tortured them, so this life, I was being tortured. I thank them instead. Because of what they had done, I have become a stronger person,” he says. “I always tell my friends, everything has karma. It is good to be kind and helpful to people rather than to start being hideous and plot negative stuff on people,” he shares. Famous comedian Robin Williams struggled with depression, as do many other comedians. Maguire is no exception. After a failed marriage, he plummeted into depression for three to four years. This distressing life event affected him so profoundly that he was confronted with a choice: ignore it, or do everything in his power to effect positive change. “I told myself, ‘Let’s see what I can do in my life’, and I read books and I looked at the world, and I looked at it very differently. And then I told myself, ‘I am going to pull myself from this depression.’ Life still goes on; just move on, get things done, learn from it and be stronger. That’s what I feel,” he says. His unhappy childhood and failed marriage has turned him into a religious man. Speaking from his own experience, “depression is something that comes to you, and that’s it”. He advises people who are suffering from depression to mix around with positive people and seek help. He wants to write a book to motivate people and to add positivity in people’s lives. The money from the sales of this book will go to charity. The book will be an autobiography of himself, and will contain words of encouragement and motivational articles to be shared with those experiencing hard times. “I believe God is fair, because it takes away something from you, but gives you something else in return. It takes something away from you, because it wants you to grow within yourself and be a better person. And I always believe in that,” he says. To him, his philosophy is simple: money, fame and knowledge will be gone when we die, that is why he believes in sharing knowledge and helping people live a better life. Maguire believes that anyone running a business should not be content with what they have. Maguire’s business management style involves fostering good relationships with staff, contractors and artistes and getting the job done. He does not believe in a rigid management style, and dislikes the word ‘boss’. Don’t call me boss. We are work buddies. He says positivity is also key in achieving one’s goals, be it business or personal goals. “If you think you cannot make it, you forever cannot make it. But if you think you can do it, then you can make it and achieve it. It is all in the mind, so never poison the mind. Heal the mind, and you will achieve something,” he advises. 20 years from now, Maguire plans to be a corporate trainer to groom new talents. “When we are the ‘old bird’, we need to leave the war, and then train the new generations to fight the war,” he says. He is also trained in image consulting as well as social and personal etiquette, and might convert his company into a corporate training service provider. In all, Maguire is an entertainer with a higher aim in life — if he had the power to help people, it would be wanting all orphans to lead a proper life, and grow up to be the next generation of people who will take over the world. He wishes to build schools and homes for orphans in third world countries. “As a person , we always try to give back to society,” he says.